Polish builder Marcin Grabowski is no stranger to large spacecraft. 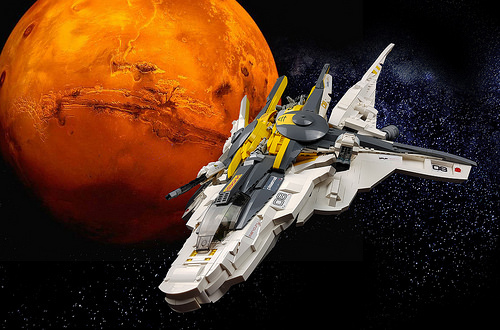 We featured his DragonFLY-class dropship last year, and he’s recently completed this wonderfully angular starfighter set against the planet Mars. 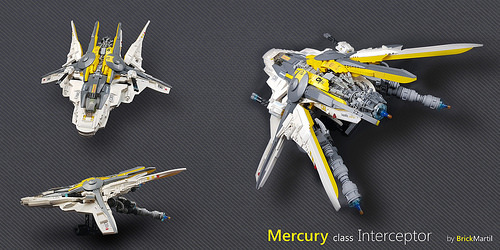 The heavily armed, predominantly white fighter fighter is complemented by technical components in shades of gray. The lines of yellow make the vehicle look like a racing ship, and I love it. You can see the top and rear of the spacecraft better in this multi-angle collage.